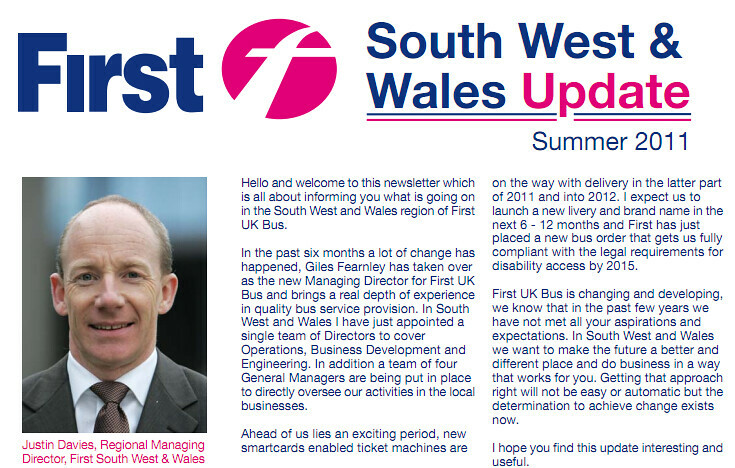 There have been rumours of a new livery for First for ages so its nice to see the comment "I expect us to launch a new livery and brand name in the next 6 - 12 months". The group seem to be heading towards the return of local identities but it remains to be seen how radical they are. Will we be seeing a small local fleet name stuck on the side of an otherwise national livery, or will we get something more interesting. The full newsletter is available HERE as a PDF on their web site. I've not read anything other than the clip on your post and not the entire First document and while agreeing about the term "stakeholder", with comments about the appointment of Giles Fearnley, perhaps this is aimed as much at local authorities and councillors who might consider themselves stakeholders. Copies of the newsletter have also been issued to staff, so 'stakeholder' really is all encompassing.